Last month, the Austin City Council approved a resolution ending a controversial process to rewrite the city’s land use regulations, a project known as CodeNEXT. This week, Strong Towns is examining issues surrounding land development regulations in Austin and the CodeNEXT process. This is the second installment in the series—read Part 1, Part 3, Part 4, and Part 5 of the series here. Austin is experiencing the beginning of a housing crisis. “We’re like San Francisco in 1992,” is one version of a common refrain—meaning residents expect the city’s rising cost of living amid a population boom to only get worse. But how exactly to deal with population growth is the subject of ceaseless debate in the area, and was a major motivator for the land use coding rewrite attempt named CodeNEXT. So let’s take a step back: what’s up with the existing code? Its most obvious feature, upon viewing a zoning map: it only allows single family homes in the vast majority of the city. 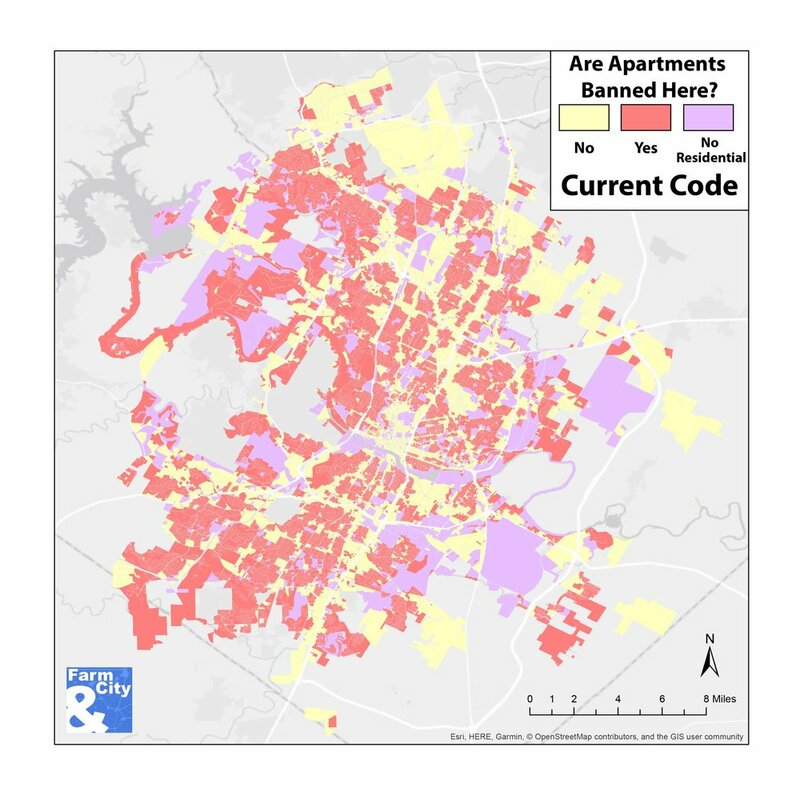 In the map below (courtesy of CodeNEXT), the yellow areas represent the large swaths of the city that are intended for single family residential use only, not allowing multi-family residences (orange) or commercial (red). Over 80% of the city is in a yellow zone. Austin also has limited allowance for mixed use buildings (represented in pink). Limiting such a generous area to only single family residences has consequences. Faced with intense demand for new housing, much of the city, by land area, simply has no place to grow. Austin added 200,294 new residents between 2005 and 2015, according to the city. This degree of growth is the reason the city, in its 2016 Draft Strategic Housing Plan, set a target of 135,000 new units in ten years, including a tripling of the share of the housing market comprised of subsidized units for lower-income households. The city’s expectation is that without keeping up this pace, some Austin residents, and some would-be residents attempting to move to Austin, will not be able to stay in the city and will be displaced. So what’s a growing city to do? How do you get private actors to build 135,000 housing units in ten years? And where do you put them? The then city council put together Imagine Austin, a comprehensive plan to make a more compact, connected city. Out of this effort came the birth of CodeNEXT. ﻿The goal for CodeNEXT was to allow flexibility in the code to meet these new housing demands, but strong opposition arose as community members worried their homes and neighborhoods would become subject to rampant redevelopment. The plan was eventually scrapped after mounting opposition led city council members to abandon ship. The entire project was a grand undertaking. It would have been the first code rewrite in more than 30 years. The idea to start from scratch was quickly averted in favor of a transitional rewrite. And from the first draft it was “severely compromised,” said Mateo Barnstone, Executive Director of a local CNU chapter. “There was a lot to like about the initial code… but it was not perfect,” he admitted. CodeNEXT’s “Austin bargain” was to stack density on the corridors and leave neighborhood interiors as is. Even with endless amending compromises, it was met with skepticism from neighborhood groups. Plans to add more Missing Middle housing (like townhouses, bungalows, and tri- and fourplexes) became more and more limited as draft iterations went on. Another urbanist goal—to remove parking requirements—was also thwarted. The latest version of CodeNEXT still required one parking spot to be developed for every new housing unit. Farm&City, a non profit think tank, estimates the cost of a parking spot to add an additional $15,000 to a new development on average, not to mention the land use required. “We don’t need parking requirements, we need more inclusive neighborhoods,” said Josiah Stevenson of AURA, which began as a transit advocacy organization and has shifted its focus to include advocating for improving land use in Austin. The neighborhood activists on the other side don’t agree. “They greatly reduced the parking requirements under the theory that less parking means they will have less cars…You can say everyone is going to ride bikes or walk but nobody believes it,” said Fred Lewis of Community Not Commodity. Another bone of contention was the city’s compatibility requirements. Compatibility in Austin’s zoning code means, for example, that even if a lot is zoned for commercial use, proximity to a residential home can limit how high a building can be built there. This has been a hurdle in neighborhoods where commercial zoning bumps up against residential houses because of the severe limitations that are then imposed. The CodeNEXT proposal would have allowed for transition zones to lessen the requirements. The stated goal of the zoning was to protect the “character” of the existing neighborhoods. As the drafting process rolled on over months, the tension rose between planners and neighborhood groups over where to add density, and how much to allow. Residents concerned with racial and socioeconomic equity also added their voices to the fight. Concerned citizens like Florence Briceño of Our Lady of Guadalupe Catholic Church claimed the change in zoning laws would displace residents of color. This concern is easy to understand. There has already been significant displacement in East Austin, the historically segregated side of the city which remains lower-income with a high proportion of non-white residents. Discontent and anxiety run high in East Austin in the face of new development. The visible increase in luxury high rise apartments built in the downtown area, for many, adds insult to injury. Groups like AURA, however, insist that meeting housing capacity needs in Central and West Austin is necessary to offset the pressures in East Austin. They also claim the current land use code “has been a major catalyst for gentrification and displacement.” AURA ultimately criticized the third draft as having “near fatal flaws,” citing its lack of middle housing and a decrease in some areas of allowable density. Others, like Jay Crossley of the nonprofit Farm&City, still called it “light years better than the original code.” According to Crossley, there are also equity issues with protecting single-family neighborhoods while channeling the city’s change to more intense areas. Farm&City estimates that while 71% of non-Hispanic White Austinites live in single-family homes, only about 55% of people of color live in single-family homes. The Imagine Austin plan was adopted in 2012, shortly before a municipal government restructuring took place. The city council changed from six at-large members to ten districts and a mayor. Most were newly elected members after the switch. The city manager also left in the process and was replaced by an interim manager. CodeNEXT also went through several project leaders throughout its development. All of this gave a sense of instability to the process, according to Barnstone. “We were on shaky ground to begin with,” he said. Through its various drafts, both the planning commission and city staff had pushed for amendments. While groups like AURA fought for more flexibility, more density, and more housing, neighborhood groups fought the change. Both felt like they hadn’t been listened to. “This is top down, cram down,” said Lewis. Further, Lewis claimed the commission was illegally constituted by allowing more than a third of members to have connections with developers. The State Attorney General, Ken Paxton, filed suit over the claims. While the suit cited the fact that the commission included three architects and a real estate agent, it also targeted Greg Anderson, Director of Austin Habitat for Humanity. One thing both those opposed and in favor of a rewrite can agree on, they don’t expect to hear anything else on Austin’s zoning until January. That’s because the mayoral and city council elections are coming in November. “There are so many variables in the politics,” says Crossley. “If the mayor loses, what happens?” Either way, the $8 million dollar project is currently on the shelf for a foreseeable time. What happens next in Austin is up in the air, but whatever comes to pass seems likely to only deepen the schisms in Austin’s growing identity crisis. For Austinites like Stevenson, many of the goals are the same. “We need to allow residential zoning on commercial corridors, allow mobile homes as ADUs (Accessory Dwelling Units), and get rid of parking requirements,” he says about a path forward. “There is a hunger and demand for stuff built in our urban core, and it’s in short supply,” said Barnstone. “There aren’t really options in Austin for my four year old son to walk to school,” adds Crossley. He blames this on the massive residential blocks. Austinites, and Austin at large, seem to be in an existential battle for their city’s identity. To enshrine single-family neighborhoods or to allow mixed use? To stay residential-only or to allow blocks to transition to something else? Where to put growth and whom to turn away? More parking? While the debate rages on, the city continues to grow, and the complications with zoning mount. Tomorrow we will go into more depth about the proposed “grand bargain” that was CodeNEXT, and why it could not overcome the city’s fractious politics and competing understandings of just what Austin is, and ought to be.